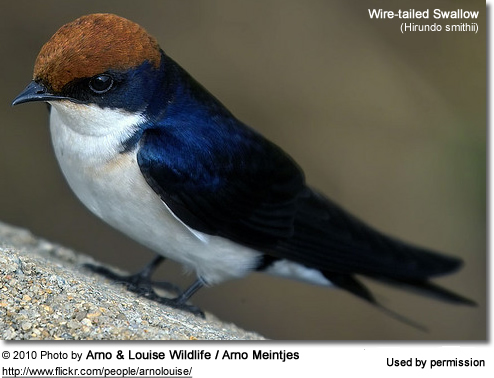 The Wire-tailed Swallows (Hirundo smithii) are swallows found in Africa and Asia. Their common name is derived from their very long, fine outer tail feathers which trail behind like two wires; and their scientific name honors Professor Chetien Smith, a Norwegian botanist, who was a member of the expedition that discovered this species. The African race is widespread south of the Sahara, except for their range extending further along the Nile, and they are not found in the western equatorial lowland forests. In southern Asia, they are found from Tadzhikistan, Afghanistan and northern Pakistan through India to Burma as well as northwestern and northeastern Thailand, Laos and central Vietnam. Rarely, vagrants travel to Sri Lanka. They are mostly resident (non-migratory), except for some populations in Pakistan and northern India that migrate south for the winter. They are usually seen in pairs close to bodies of water and human habitation; or these fast fliers may fly low over water as they pursue their prey. African form found in sub-Saharan Africa; specifically in western Africa from Senegal east to southern Mali south to the central Ivory Coast east to central and southern Sudan, Ethiopia and Somalia, and south (avoiding the central rainforest zone) to northern Namibia, northern Botswana and northeastern South Africa. ID: Smaller and shorter-tailed than the Asian form. Asian form found in southern Uzbekistan south through Tajikistan, Afghanistan, Pakistan, India east to southwestern Nepal, Burma / Myanmar, northern Thailand, Laos, Cambodia and central Vietnam. 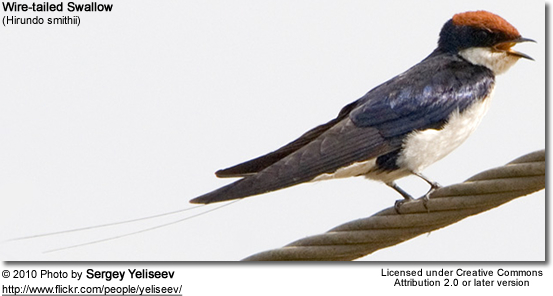 Wire-tailed Swallows measure 5.6 inches or 14 cm in length. The plumage is mostly bright blue above, except for the reddish-brown crown (top of the head) and white spots on the tail. 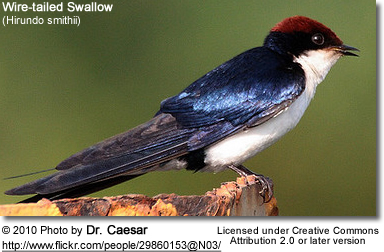 There is a blue bar extending from the beak through the eyes down to the neck and back. The plumage below is white, except for the darker flight feathers. 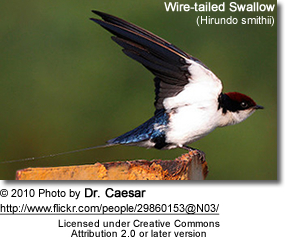 As suggested by their name, they have very long, outer tail feathers which trail behind like wires. Females resemble the males, except they have shorter outertail feathers. Immature birds can be recognized by their brown crown, back and tail. 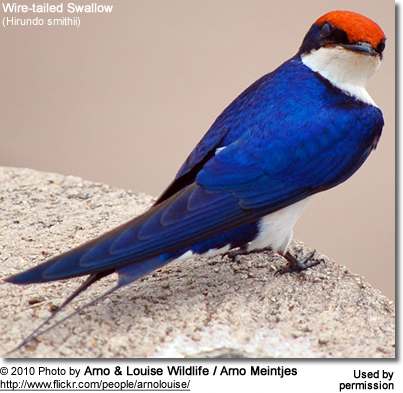 Wire-tailed Swallows mostly feed on insects (particularly flies), often caught in flight. They are often observed in fast aerial pursuits of their insect prey. They construct neat half-bowl nests placed on vertical surfaces near water, such as below the ledges of cliffs or man-made structures, such as buildings and bridges. 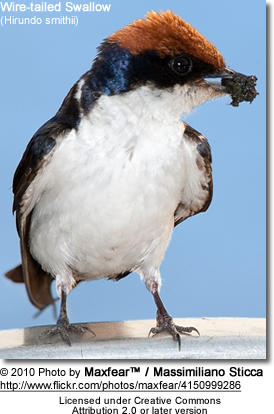 They collect mud with their beaks to line their nests with. The average clutch consists of 3 - 4 eggs in Africa, and in Asia, up to 5 have been reported. 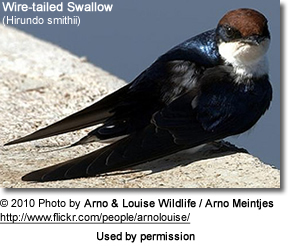 Unlike many other swallow species, which nest in colonies - the Wire-tailed Swallows are solitary and territorial nesters. Please Note: The images on this page are the sole property of the photographers (unless marked as Public Domain). Please contact the photographers directly for any copyright or licensing questions. Thank you.